UPDATE: Sega has made Sonic Generations on PC official. The game will be available to download from Sega's digital partners on 4th November. It includes Steamworks features such as Steam Cloud, which allows save files to be stored on Steam's servers so you can resume your game progress from any PC. Like the home console versions, the PC version features full stereoscopic 3D support and contains achievements and online leaderboards. ORIGINAL STORY: Sonic Generations looks a dead cert for PC after a digital shop listed the game alongside minimum and recommended specs. Green Man Gaming has a pre-order option up for the game right now (spotted by Destructoid). On GMG it costs £16.95, down from £19.95. Microsoft Windows 7 Intel Core i5 @ 2.66 GHz / AMD Phenom II X4 @ 3.0 GHz 3GB RAM NVIDIA GeForce GTX 460 / ATI Radeon HD 5850 11 GB free hard drive space. 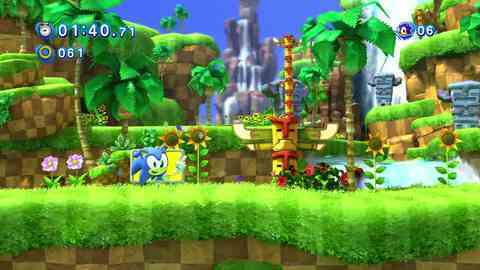 Sonic Generations is the hybrid of vintage 2D side-scrolling Sonic and the more recent 3D offerings. The story follows Sonic as he is sucked off back through time, reliving the series' history. Sega issued Eurogamer a "no comment" on the PC version this morning. Stay tuned.